Learn about how Azure routes traffic between Azure, on-premises, and Internet resources. Azure automatically creates a route table for each subnet within an Azure virtual network and adds system default routes to the table. To learn more about virtual networks and subnets, see Virtual network overview. You can override some of Azure's system routes with custom routes, and add additional custom routes to route tables. Azure routes outbound traffic from a subnet based on the routes in a subnet's route table. Azure automatically creates system routes and assigns the routes to each subnet in a virtual network. You can't create system routes, nor can you remove system routes, but you can override some system routes with custom routes. Azure creates default system routes for each subnet, and adds additional optional default routes to specific subnets, or every subnet, when you use specific Azure capabilities. Virtual network: Routes traffic between address ranges within the address space of a virtual network. Azure creates a route with an address prefix that corresponds to each address range defined within the address space of a virtual network. If the virtual network address space has multiple address ranges defined, Azure creates an individual route for each address range. Azure automatically routes traffic between subnets using the routes created for each address range. You don't need to define gateways for Azure to route traffic between subnets. Though a virtual network contains subnets, and each subnet has a defined address range, Azure does not create default routes for subnet address ranges, because each subnet address range is within an address range of the address space of a virtual network. Internet: Routes traffic specified by the address prefix to the Internet. The system default route specifies the 0.0.0.0/0 address prefix. If you don't override Azure's default routes, Azure routes traffic for any address not specified by an address range within a virtual network, to the Internet, with one exception. If the destination address is for one of Azure's services, Azure routes the traffic directly to the service over Azure's backbone network, rather than routing the traffic to the Internet. Traffic between Azure services does not traverse the Internet, regardless of which Azure region the virtual network exists in, or which Azure region an instance of the Azure service is deployed in. You can override Azure's default system route for the 0.0.0.0/0 address prefix with a custom route. 10.0.0.0/8, 172.16.0.0/12, and 192.168.0.0/16: Reserved for private use in RFC 1918. 100.64.0.0/10: Reserved in RFC 6598. If you assign any of the previous address ranges within the address space of a virtual network, Azure automatically changes the next hop type for the route from None to Virtual network. If you assign an address range to the address space of a virtual network that includes, but isn't the same as, one of the four reserved address prefixes, Azure removes the route for the prefix and adds a route for the address prefix you added, with Virtual network as the next hop type. Default Multiple VirtualNetworkServiceEndpoint Only the subnet a service endpoint is enabled for. Virtual network (VNet) peering: When you create a virtual network peering between two virtual networks, a route is added for each address range within the address space of each virtual network a peering is created for. Learn more about virtual network peering. Virtual network gateway: One or more routes with Virtual network gateway listed as the next hop type are added when a virtual network gateway is added to a virtual network. The source is also virtual network gateway, because the gateway adds the routes to the subnet. If your on-premises network gateway exchanges border gateway protocol (BGP) routes with an Azure virtual network gateway, a route is added for each route propagated from the on-premises network gateway. It's recommended that you summarize on-premises routes to the largest address ranges possible, so the fewest number of routes are propagated to an Azure virtual network gateway. There are limits to the number of routes you can propagate to an Azure virtual network gateway. For details, see Azure limits. VirtualNetworkServiceEndpoint: The public IP addresses for certain services are added to the route table by Azure when you enable a service endpoint to the service. Service endpoints are enabled for individual subnets within a virtual network, so the route is only added to the route table of a subnet a service endpoint is enabled for. The public IP addresses of Azure services change periodically. Azure manages the addresses in the route table automatically when the addresses change. Learn more about virtual network service endpoints, and the services you can create service endpoints for. The VNet peering and VirtualNetworkServiceEndpoint next hop types are only added to route tables of subnets within virtual networks created through the Azure Resource Manager deployment model. The next hop types are not added to route tables that are associated to virtual network subnets created through the classic deployment model. Learn more about Azure deployment models. You create custom routes by either creating user-defined routes, or by exchanging border gateway protocol (BGP) routes between your on-premises network gateway and an Azure virtual network gateway. You can create custom, or user-defined, routes in Azure to override Azure's default system routes, or to add additional routes to a subnet's route table. In Azure, you create a route table, then associate the route table to zero or more virtual network subnets. Each subnet can have zero or one route table associated to it. To learn about the maximum number of routes you can add to a route table and the maximum number of user-defined route tables you can create per Azure subscription, see Azure limits. If you create a route table and associate it to a subnet, the routes within it are combined with, or override, the default routes Azure adds to a subnet by default. The private IP address of a network interface attached to a virtual machine. Any network interface attached to a virtual machine that forwards network traffic to an address other than its own must have the Azure Enable IP forwarding option enabled for it. The setting disables Azure's check of the source and destination for a network interface. Learn more about how to enable IP forwarding for a network interface. Though Enable IP forwarding is an Azure setting, you may also need to enable IP forwarding within the virtual machine's operating system for the appliance to forward traffic between private IP addresses assigned to Azure network interfaces. If the appliance must route traffic to a public IP address, it must either proxy the traffic, or network address translate the private IP address of the source's private IP address to its own private IP address, which Azure then network address translates to a public IP address, before sending the traffic to the Internet. To determine required settings within the virtual machine, see the documentation for your operating system or network application. To understand outbound connections in Azure, see Understanding outbound connections. Deploy a virtual appliance into a different subnet than the resources that route through the virtual appliance are deployed in. Deploying the virtual appliance to the same subnet, then applying a route table to the subnet that routes traffic through the virtual appliance, can result in routing loops, where traffic never leaves the subnet. The private IP address of an Azure internal load balancer. A load balancer is often used as part of a high availability strategy for network virtual appliances. You can define a route with 0.0.0.0/0 as the address prefix and a next hop type of virtual appliance, enabling the appliance to inspect the traffic and determine whether to forward or drop the traffic. If you intend to create a user-defined route that contains the 0.0.0.0/0 address prefix, read 0.0.0.0/0 address prefix first. Virtual network gateway: Specify when you want traffic destined for specific address prefixes routed to a virtual network gateway. The virtual network gateway must be created with type VPN. You cannot specify a virtual network gateway created as type ExpressRoute in a user-defined route because with ExpressRoute, you must use BGP for custom routes. You can define a route that directs traffic destined for the 0.0.0.0/0 address prefix to a route-based virtual network gateway. On your premises, you might have a device that inspects the traffic and determines whether to forward or drop the traffic. If you intend to create a user-defined route for the 0.0.0.0/0 address prefix, read 0.0.0.0/0 address prefix first. Instead of configuring a user-defined route for the 0.0.0.0/0 address prefix, you can advertise a route with the 0.0.0.0/0 prefix via BGP, if you've enabled BGP for a VPN virtual network gateway. None: Specify when you want to drop traffic to an address prefix, rather than forwarding the traffic to a destination. If you haven't fully configured a capability, Azure may list None for some of the optional system routes. For example, if you see None listed as the Next hop IP address with a Next hop type of Virtual network gateway or Virtual appliance, it may be because the device isn't running, or isn't fully configured. Azure creates system default routes for reserved address prefixes with None as the next hop type. Virtual network: Specify when you want to override the default routing within a virtual network. See Routing example, for an example of why you might create a route with the Virtual network hop type. Internet: Specify when you want to explicitly route traffic destined to an address prefix to the Internet, or if you want traffic destined for Azure services with public IP addresses kept within the Azure backbone network. You cannot specify VNet peering or VirtualNetworkServiceEndpoint as the next hop type in user-defined routes. Routes with the VNet peering or VirtualNetworkServiceEndpoint next hop types are only created by Azure, when you configure a virtual network peering, or a service endpoint. ExpressRoute: You must use BGP to advertise on-premises routes to the Microsoft edge router. You cannot create user-defined routes to force traffic to the ExpressRoute virtual network gateway if you deploy a virtual network gateway deployed as type: ExpressRoute. You can use user-defined routes for forcing traffic from the Express Route to, for example, a Network Virtual Appliance. VPN: You can, optionally use BGP. For details, see BGP with site-to-site VPN connections. When you exchange routes with Azure using BGP, a separate route is added to the route table of all subnets in a virtual network for each advertised prefix. The route is added with Virtual network gateway listed as the source and next hop type. ER and VPN Gateway route propagation can be disabled on a subnet using a property on a route table. When you exchange routes with Azure using BGP, routes are not added to the route table of all subnets with BGP propagation disabled. Connectivity with VPN connections is achieved using custom routes with a next hop type of Virtual network gateway. For details, see How to disable BGP route propagation. When outbound traffic is sent from a subnet, Azure selects a route based on the destination IP address, using the longest prefix match algorithm. For example, a route table has two routes: One route specifies the 10.0.0.0/24 address prefix, while the other route specifies the 10.0.0.0/16 address prefix. Azure routes traffic destined for 10.0.0.5, to the next hop type specified in the route with the 10.0.0.0/24 address prefix, because 10.0.0.0/24 is a longer prefix than 10.0.0.0/16, even though 10.0.0.5 is within both address prefixes. Azure routes traffic destined to 10.0.1.5, to the next hop type specified in the route with the 10.0.0.0/16 address prefix, because 10.0.1.5 isn't included in the 10.0.0.0/24 address prefix, therefore the route with the 10.0.0.0/16 address prefix is the longest prefix that matches. System routes for traffic related to virtual network, virtual network peerings, or virtual network service endpoints, are preferred routes, even if BGP routes are more specific. When traffic is destined for an IP address outside the address prefixes of any other routes in the route table, Azure selects the route with the User source, because user-defined routes are higher priority than system default routes. See Routing example for a comprehensive routing table with explanations of the routes in the table. A route with the 0.0.0.0/0 address prefix instructs Azure how to route traffic destined for an IP address that is not within the address prefix of any other route in a subnet's route table. When a subnet is created, Azure creates a default route to the 0.0.0.0/0 address prefix, with the Internet next hop type. If you don't override this route, Azure routes all traffic destined to IP addresses not included in the address prefix of any other route, to the Internet. The exception is that traffic to the public IP addresses of Azure services remains on the Azure backbone network, and is not routed to the Internet. If you override this route, with a custom route, traffic destined to addresses not within the address prefixes of any other route in the route table is sent to a network virtual appliance or virtual network gateway, depending on which you specify in a custom route. Azure sends all traffic to the next hop type specified in the route, including traffic destined for public IP addresses of Azure services. When the next hop type for the route with the 0.0.0.0/0 address prefix is Internet, traffic from the subnet destined to the public IP addresses of Azure services never leaves Azure's backbone network, regardless of the Azure region the virtual network or Azure service resource exist in. When you create a user-defined or BGP route with a Virtual network gateway or Virtual appliance next hop type however, all traffic, including traffic sent to public IP addresses of Azure services you haven't enabled service endpoints for, is sent to the next hop type specified in the route. If you've enabled a service endpoint for a service, traffic to the service is not routed to the next hop type in a route with the 0.0.0.0/0 address prefix, because address prefixes for the service are specified in the route that Azure creates when you enable the service endpoint, and the address prefixes for the service are longer than 0.0.0.0/0. Be able to network address translate and forward, or proxy the traffic to the destination resource in the subnet, and return the traffic back to the Internet. Virtual network gateway: If the gateway is an ExpressRoute virtual network gateway, an Internet-connected device on-premises can network address translate and forward, or proxy the traffic to the destination resource in the subnet, via ExpressRoute's private peering. If your virtual network is connected to an Azure VPN gateway, do not associate a route table to the gateway subnet that includes a route with a destination of 0.0.0.0/0. Doing so can prevent the gateway from functioning properly. For details, see the Why are certain ports opened on my VPN gateway? question in the VPN Gateway FAQ. See DMZ between Azure and your on-premises datacenter and DMZ between Azure and the Internet for implementation details when using virtual network gateways and virtual appliances between the Internet and Azure. This example is not intended to be a recommended or best practice implementation. Rather, it is provided only to illustrate concepts in this article. Implement two virtual networks in the same Azure region and enable resources to communicate between the virtual networks. Enable an on-premises network to communicate securely with both virtual networks through a VPN tunnel over the Internet. Alternatively, an ExpressRoute connection could be used, but in this example, a VPN connection is used. Force all outbound traffic from the subnet, except to Azure Storage and within the subnet, to flow through a network virtual appliance, for inspection and logging. Do not inspect traffic between private IP addresses within the subnet; allow traffic to flow directly between all resources. Drop any outbound traffic destined for the other virtual network. Enable outbound traffic to Azure storage to flow directly to storage, without forcing it through a network virtual appliance. Allow all traffic between all other subnets and virtual networks. Arrows show the flow of traffic. Azure automatically added this route for all subnets within Virtual-network-1, because 10.0.0.0/16 is the only address range defined in the address space for the virtual network. If the user-defined route in route ID2 weren't created, traffic sent to any address between 10.0.0.1 and 10.0.255.254 would be routed within the virtual network, because the prefix is longer than 0.0.0.0/0, and not within the address prefixes of any of the other routes. Azure automatically changed the state from Active to Invalid, when ID2, a user-defined route, was added, since it has the same prefix as the default route, and user-defined routes override default routes. The state of this route is still Active for Subnet2, because the route table that user-defined route, ID2 is in, isn't associated to Subnet2. Azure added this route when a user-defined route for the 10.0.0.0/16 address prefix was associated to the Subnet1 subnet in the Virtual-network-1 virtual network. The user-defined route specifies 10.0.100.4 as the IP address of the virtual appliance, because the address is the private IP address assigned to the virtual appliance virtual machine. The route table this route exists in is not associated to Subnet2, so doesn't appear in the route table for Subnet2. This route overrides the default route for the 10.0.0.0/16 prefix (ID1), which automatically routed traffic addressed to 10.0.0.1 and 10.0.255.254 within the virtual network through the virtual network next hop type. This route exists to meet requirement 3, to force all outbound traffic through a virtual appliance. Azure added this route when a user-defined route for the 10.0.0.0/24 address prefix was associated to the Subnet1 subnet. Traffic destined for addresses between 10.0.0.1 and 10.0.0.254 remains within the subnet, rather than being routed to the virtual appliance specified in the previous rule (ID2), because it has a longer prefix than the ID2 route. This route was not associated to Subnet2, so the route does not appear in the route table for Subnet2. This route effectively overrides the ID2 route for traffic within Subnet1. This route exists to meet requirement 3. Azure automatically added the routes in IDs 4 and 5 for all subnets within Virtual-network-1, when the virtual network was peered with Virtual-network-2. Virtual-network-2 has two address ranges in its address space: 10.1.0.0/16 and 10.2.0.0/16, so Azure added a route for each range. If the user-defined routes in route IDs 6 and 7 weren't created, traffic sent to any address between 10.1.0.1-10.1.255.254 and 10.2.0.1-10.2.255.254 would be routed to the peered virtual network, because the prefix is longer than 0.0.0.0/0, and not within the address prefixes of any of the other routes. Azure automatically changed the state from Active to Invalid, when the routes in IDs 6 and 7 were added, since they have the same prefixes as the routes in IDs 4 and 5, and user-defined routes override default routes. The state of the routes in IDs 4 and 5 are still Active for Subnet2, because the route table that the user-defined routes in IDs 4 and 5 are in, isn't associated to Subnet2. A virtual network peering was created to meet requirement 1. Azure added this route and the route in ID7, when user-defined routes for the 10.1.0.0/16 and 10.2.0.0/16 address prefixes were associated to the Subnet1 subnet. Traffic destined for addresses between 10.1.0.1-10.1.255.254 and 10.2.0.1-10.2.255.254 is dropped by Azure, rather than being routed to the peered virtual network, because user-defined routes override default routes. The routes are not associated to Subnet2, so the routes do not appear in the route table for Subnet2. The routes override the ID4 and ID5 routes for traffic leaving Subnet1. The ID6 and ID7 routes exist to meet requirement 3 to drop traffic destined to the other virtual network. 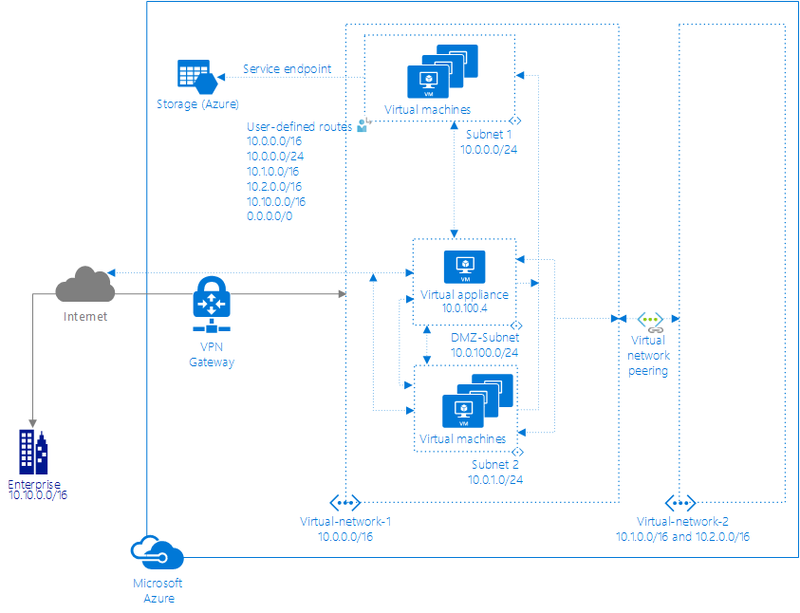 Azure automatically added this route for all subnets within Virtual-network-1 when a VPN type virtual network gateway was created within the virtual network. Azure added the public IP address of the virtual network gateway to the route table. Traffic sent to any address between 10.10.0.1 and 10.10.255.254 is routed to the virtual network gateway. The prefix is longer than 0.0.0.0/0 and not within the address prefixes of any of the other routes. A virtual network gateway was created to meet requirement 2. Azure added this route when a user-defined route for the 10.10.0.0/16 address prefix was added to the route table associated to Subnet1. This route overrides ID8. The route sends all traffic destined for the on-premises network to an NVA for inspection, rather than routing traffic directly on-premises. This route was created to meet requirement 3. Azure automatically added this route to the subnet when a service endpoint to an Azure service was enabled for the subnet. Azure routes traffic from the subnet to a public IP address of the service, over the Azure infrastructure network. The prefix is longer than 0.0.0.0/0 and not within the address prefixes of any of the other routes. A service endpoint was created to meet requirement 3, to enable traffic destined for Azure Storage to flow directly to Azure Storage. Azure automatically added this route to the route table of all subnets within Virtual-network-1 and Virtual-network-2. The 0.0.0.0/0 address prefix is the shortest prefix. Any traffic sent to addresses within a longer address prefix are routed based on other routes. By default, Azure routes all traffic destined for addresses other than the addresses specified in one of the other routes to the Internet. Azure automatically changed the state from Active to Invalid for the Subnet1 subnet when a user-defined route for the 0.0.0.0/0 address prefix (ID12) was associated to the subnet. The state of this route is still Active for all other subnets within both virtual networks, because the route isn't associated to any other subnets within any other virtual networks. Azure added this route when a user-defined route for the 0.0.0.0/0 address prefix was associated to the Subnet1 subnet. The user-defined route specifies 10.0.100.4 as the IP address of the virtual appliance. This route is not associated to Subnet2, so the route does not appear in the route table for Subnet2. All traffic for any address not included in the address prefixes of any of the other routes is sent to the virtual appliance. The addition of this route changed the state of the default route for the 0.0.0.0/0 address prefix (ID11) from Active to Invalid for Subnet1, because a user-defined route overrides a default route. This route exists to meet requirement 3. The route table for Subnet2 contains all Azure-created default routes and the optional VNet peering and Virtual network gateway optional routes. Azure added the optional routes to all subnets in the virtual network when the gateway and peering were added to the virtual network. Azure removed the routes for the 10.0.0.0/8, 172.16.0.0/12, 192.168.0.0/16, and 100.64.0.0/10 address prefixes from the Subnet1 route table when the user-defined route for the 0.0.0.0/0 address prefix was added to Subnet1. View all routes for a subnet. A user-defined route table only shows you the user-defined routes, not the default, and BGP routes for a subnet. Viewing all routes shows you the default, BGP, and user-defined routes for the subnet a network interface is in. Determine the next hop type between a virtual machine and a destination IP address. The Azure Network Watcher next hop feature enables you to determine whether traffic is leaving a subnet and being routed to where you think it should be.